In yet another dramatic and beautiful proof that the Moon Swirls of Planet X exist are these recent captures. Moon Swirls, long tubes that can funnel and focus sunlight toward the Earth, are seen around the Sun so frequently and without the need for any filters. 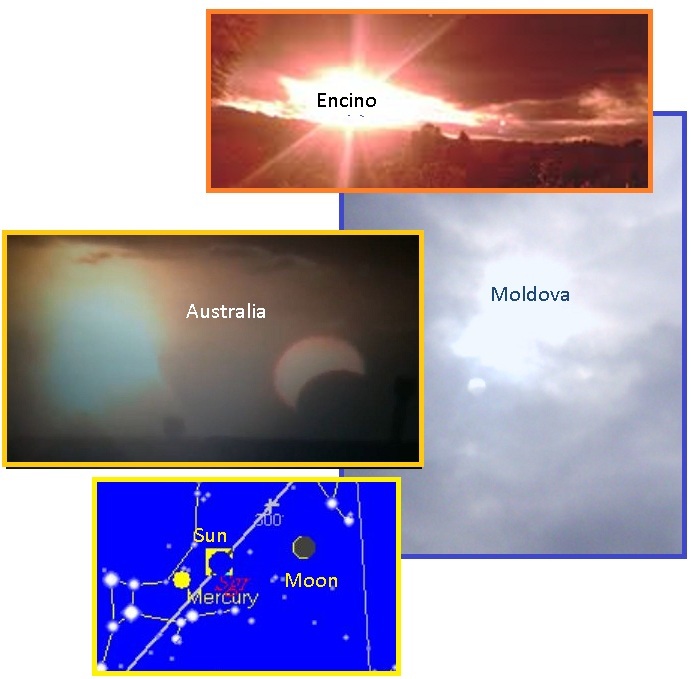 The first photo was taken in Moldova, showing the Moon Swirl eclipsed somewhat by clouds. A tailing string of Moon Swirl orbs can be seen dropping down below the Sun at about the 7 o’clock position, with others clustered under the Sun at the 4 o’clock position – visible even behind the clouds. Moon Swirl orbs rival the light from the Sun, as it is focused sunlight. The photo of a recent sunset in Encino CA shows a Moon Swirl at the 3 o’clock position. This same Moon Swirl at about the 3 o’clock position shows up on virtually the same day that a Moon Swirl was eclipsed by the Moon at this same 3 o’clock position to the Sun on January 11, 2013. Signs in the skies indeed! Last covered in this newsletter on March 25, 2012 in Issue 286, asteroids slinging past, close to Earth, are once again a hot topic. In November, 2011 asteroid YU55 came within 220,000 miles of Earth, within the orbit of the Moon. Then in June, 2012 asteroid LZ1 came within 14 lunar distances of Earth. On January 8, 2013 asteroid Apophis came within 9,000,000 miles of the Earth, close enough for inspection. In the year 2029 Apophis is expected to sling by within 18,600 miles of Earth. On February 15, 2013 asteroid DA14 is expected to pass within 21,000 miles of Earth, closer than some of our satellites, and return in 2020 for another close pass. The near-Earth asteroid 2012 LZ1, which astronomers think is about 1,650 feet (500 meters) wide, will come within 14 lunar distances of Earth. 2012 LZ1 is roughly the same size as asteroid 2005 YU55, which made a much-anticipated flyby of Earth last November. But 2005 YU55 gave our planet a much closer shave, coming within 202,000 miles (325,000 km) of us on the evening of November 8. A space rock as big as 2005 YU55 hadn't come so close to Earth since 1976, researchers said. A near-Earth asteroid – called 2012 DA14 by astronomers – will pass very close to Earth on February 15, 2013. Astronomers estimate that, when it’s closest to us, it’ll be within the orbit of the moon (which is about 240,000 miles away), and within the orbits of geosynchronous satellites (about 26,000 miles up). 2012 DA14 will be about 21,000 miles (35,000 kilometers) away. Named after the god of evil and darkness in Egyptian mythology, Apophis sparked a scare when it was first detected in 2004. A distance of 35,000 kilometres (22,500 miles), meaning it will flit past inside the orbit of geostationary satellites, is the latest estimate for 2029, ESA said. 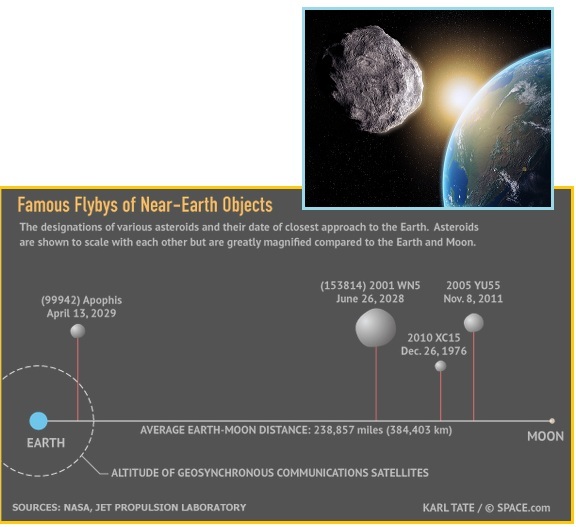 In 2029, Apophis is expected to make an extremely close pass to Earth, brushing past the Earth at a distance of just 30,000 kilometers (18,600 miles) – well within the orbit of communication satellites. While astronomers have ruled out the potential of impact, there is still a small chance of an impact in 2036; the principal source of uncertainty is the acceleration due to the Yarkovsky effect, a non-gravitational effect that is a function of the asteroid’s rotation period, pole direction, thermal properties, mass, shape, and dimensions. Does it seem there is an increase in such Near Earth Asteroids lately? Per the Zetas, this is due to the near proximity of Planet X, which collects trash in its tail as it sweeps through the solar system, and wafts that tail ever closer to the Earth as it prepares for the passage. ZetaTalk Explanation 2001: There is a great deal of trash that trails behind Planet X, caught in its gravity field. Several moons, and lesser objects such as boulders and dust. There are likewise asteroids from the Asteroid Belt which attach during a passage, but can be torn away when a passage close to another gravitational object occurs. These minor objects assume new orbits, in many cases around more than one planet if they are in close proximity to each other at the time, and finally to become disconnected or to assume what is termed a Near Earth Orbit object. How do you suppose they got into those orbits in the first place? Earth scientists concerned about the potential of impact engaged the Zetas in debate on the sci.astro Usenet between 1997 and 2003, presenting various theories about how to deflect such Earth-bound missiles. Reagan’s Star Wars vision, ostensibly for missile defense, was promoted for just such a defense. Note the continuous emphasis on being prepared by the year 2003 in this 1996 bill proposed by Bob Dole. 2003 was the year Planet X zoomed into the inner solar system, a Zeta prediction that proved to be 100% on target. A Zeta prediction that was taken seriously in 1996, the year after the ZetaTalk saga was born in the public eye. Such was the gravitas carried by the Zeta predictions among those in the know, members of MJ12 who were acquainted with the Service-to-Other Zetas. [Page: S5716] Often forgotten in the debate on the national missile defense is the question of whether technology is sufficiently mature enough to mandate the year 2003 as the deployment date. … Not only will we be limiting the testing and evaluation of the system in a push to field a system at an earlier and unnecessary date, we will be locking ourselves into certain technologies which may become obsolete by the year 2003. [Page: S5717] One of the most wasteful items (in the House defense budget) is the $4 billion earmarked to construct a missile defense system by 2003. … Quote from Democratic Reform News. The bill would order work to start on an anti-missile system (much less grandiose than the trillion-dollar Star Wars "invisible shield" President Reagan favored) that could theoretically shoot down an intercontinental missile or two launched at our territory by a small rogue country like Libya, North Korea, Iran, Iraq, or for that matter Denmark (hey, you never know) by the year 2003. ZetaTalk Prediction 7/15/1996: Does mankind now have the means to deflect such large, rapidly moving objects? Such a deflection would require a precisely placed explosive device of sufficient strength to vaporize the asteroid. Disintegration would be required because deflection is not possible in space. A nuclear explosion set off on the surface of an object in space would have minimal effect, as the explosion can expand in all directions at once. Nuclear explosions on the Earth's surface are an irresistible force meeting an immovable object - the Earth! Where the explosion can expand up or outward into the atmosphere there is only air turbulence. The portion of the explosion that is on the land side, or in the case of an underground explosion is encapsulated, is between a rock and a hot expanding place. The explosion is forced into the rock strata by the continuously expanding center of the explosion. Solid rock vaporized by nuclear explosions on the Earth's surface does not equate to the damage that would be done by one or even many nuclear devices on the surface of an asteroid. All parts of the explosion move rapidly out into space, and thus the asteroid is safely away before the nuke really gets going. A firecracker. A gnat. A sneeze. And the asteroid proceeds on its way, having only momentarily stepped aside to avoid mankind's silly experiment. Per the Zetas, though man does not have it within his capacity to deflect asteroids, the Council of Worlds is not about to let the Earth be destroyed by a mere asteroid. They have plans for the Earth. ZetaTalk Reassurance 4/15/2006: We have stated before when questions of Near Earth Orbit asteroids came up that the Council of Worlds has granted an exception, a waver in interfering with anything that would devastate the earth, snuff out life on earth, or start any kind of a chain reaction that would preclude life from continuing on earth. This includes large asteroids. Should something just drop into the ocean and cause high tides this is not the case. Should something drop on Earth, and open up a super volcano that would be the case. So we are telling you no such impact will happen on Earth that would cause an extinction level event, as it's often called. Highs and lows, side by side in a region. As with the temperature extremes in Siberia and Europe, noted in Issue 328 of this newsletter on January 13, 2013, where extreme highs in Europe were side by side with extreme cold in Siberia. Of course this is the daily Earth wobble causing all of this. Now we have heat records in Australia being broken while India and Bangladesh suffers under extreme and record breaking cold. How far apart are these two regions? Are they not literally at the same distance from the Equator, and virtual neighbors? The hot weather that has fuelled fires in southern Australia has also delivered the nation its hottest day since records began a century ago. In records going way back to the start of 1911 - with an average temperature of 40.33 - is Australia's new hottest day on record. The previous all-time high was in 1972. At least 26 persons have died in the state over the last two days due to the bone-chilling cold conditions with statewide maximum temperatures dipping about 9-14 degrees Celsius below normal. A cold snap which saw temperatures drop on Thursday to their lowest point in Bangladesh's post-independence history has killed around 80 people. That the wobble is affecting the weather can be seen in the sand storm that suddenly arose and blew out to sea near Onslow, Australia. As the Zetas note, there are several clues that this was wobble induced. 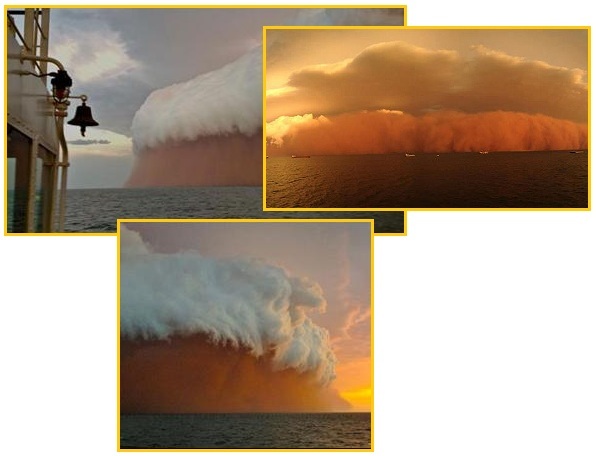 The thunderstorm, unrelated to Tropical Cyclone Narelle, which is due to make landfall later today, appeared at sunset on Wednesday evening off the coast of Onslow, in the Pilbara region in WA's northwest. The storm was casually building in the distance, then it got faster and faster and it went from glass to about 40 knots in two minutes. ZetaTalk Comment 1/12/2013: One clue that the wobble is involved is the sudden change in wind speed, from dead calm to gusty. Another clue is the direction of wind. If normally coming in from the ocean at sunset, then it is not normal for the winds to blow outward from land. During the day, the land heats up, thus reducing the air pressure so that winds come from the ocean, rather than the other way around. A third clue is that sand storm do not carry out over the ocean, due to the extra humidity picked up by the winds over the oceans so that rain results, clearing the air of the dust particles. Where the public is not getting an explanation as yet from any source other than ZetaTalk, they are noticing, and becoming uneasy. Weather extremes have simultaneously struck the continental US, with the East Coast experiencing record breaking heat while California is experiencing the opposite. Once again, at the same latitude, in the same region, yet the extremes are in opposite directions. 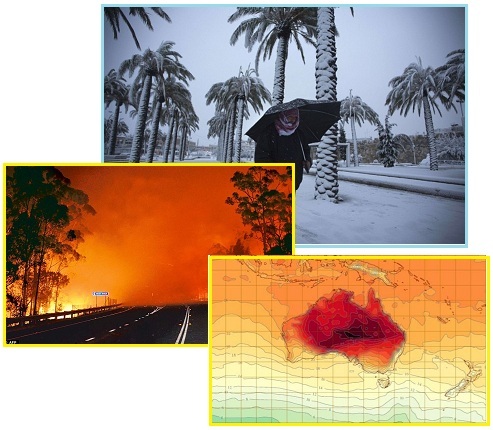 Europe and Siberia, Australia and India, East Coast and West Coast – these weather extremes are a sign of the times. Record Warmth: Spring from January? Yes, your calendar may say "January", but the pattern shaping up for these areas may give you spring fever. Specifically, a ridge of high pressure aloft centered from the Florida Peninsula to the Bahamas and southwest Atlantic Ocean will bow northward, bumping the polar jet stream into eastern Canada, keeping cold air bottled up in the West and Plains states through the weekend. Daily record highs will fall by the wayside through the weekend in the South and East. International Falls, Minn. reached 48 degrees, beating its previous record high for the day by seven degrees. California was going from cold to colder Friday as a chill expected to bring the biggest mercury dips in years descended on much of the state. Forecasters warned that a low pressure trough sinking over San Diego County and parts of neighboring Orange County could keep nightly temperatures below the freezing point in coastal areas. Record-challenging highs are forecast with temperatures reaching the 60s over a broad area of the Ohio Valley and the interior mid-Atlantic with 70 degrees within reach in a couple of locations. 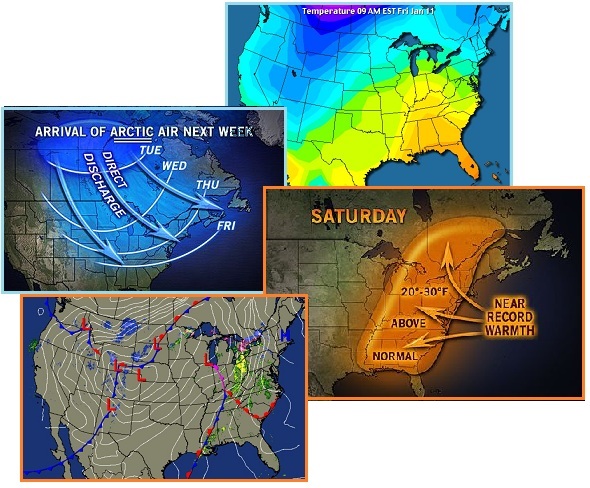 While near- and below-zero air aims for the northern Plains. The Annunaki will not be returning to Earth, though this is a matter under speculation by many. They were our slave masters in the not that distant past, chased off the Earth by the Council of Worlds who deemed their influence on mankind too repressive. The school house for spiritual growth was unbalanced, as the Annunaki were seen as giants, and were giving early man a sense of hopelessness. A quarantine is in place, separating mankind from their former slave masters. Even though Nibiru is passing through the solar system, there will be no interaction between the Annunaki and Earthlings. ZetaTalk Description 2/15/2002: The quarantine was put into place some thousands of years ago, but close enough in your recent past that contact with these alien life forms remains in your legends. They have no plans, despite fear mongering among those claiming to be in contact with these folks, to return to Earth, which they consider a swamp. The Earth in their memory is full of carnivors, rebelling slaves, and accidents related to wild weather. Now that mankind has technology, a fact that cannot be denied due to probes sent about and requiring their mining operation on Mars to shoot them down when they come too close, they are even less inclinded to visit. They were on top before, but do not anticipate wining a war on Earth today due to numbers. In addition, what would the gain be? Do you live in a swamp when you can live in a palace on the hilltop? This was not a vacation resort for them, but going into the field on a mission, not the chosen one either. The inhabitants are interested, during this passage, in collecting the gold mined since the past passage. The Annunaki built the Great Pyramids, estimated to be 3,800 years old, as navigational devices prior to the last Pole Shift. They were on Earth up until that time. 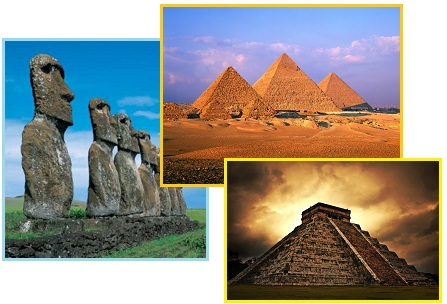 Traces of the Annunaki on Earth are the Great Pyramids, the heads of Easter Island, landing glyphs found in Peru and Tibet, their influence on the Mayan culture, the ancient Summerian record of their cultures, and the descriptions of many ancient gods. Patagonia giants are half-breeds, carrying the genes of the Annunaki, and those many myths like David and Goliath and Samson are describing the genetics and remnants of the Annunaki. ZetaTalk Description 7/15/1995: The Great Pyramids were built essentially as Navigational Devices. Why was it necessary to build such large structures as interstellar navigational guides? ZetaTalk Description 7/15/1995: The giant hominoids had long faces. The Easter Island heads were designed to intimidate, as this appearance in the faces was and is indeed their facial structure. ZetaTalk Description 7/15/1997: To the primitive humans, who came barely to the waists of the strapping, handsome giants, they were gods. 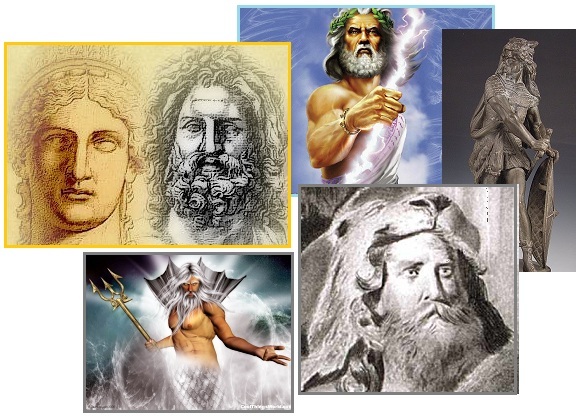 Ancient Egyptian gods, ancient Babylonian gods, the Vizigoths of Germany, ancient Mayan and Incan gods, are almost to a one particular individuals from Annunaki royalty, stationed on Earth to supervise mining operations. ZetaTalk Description 7/15/1995: These giants were approximately 50% larger than man, as their home planet is more dense and massive and the gravity on the surface that much stronger. Larger bones are needed to support life there. 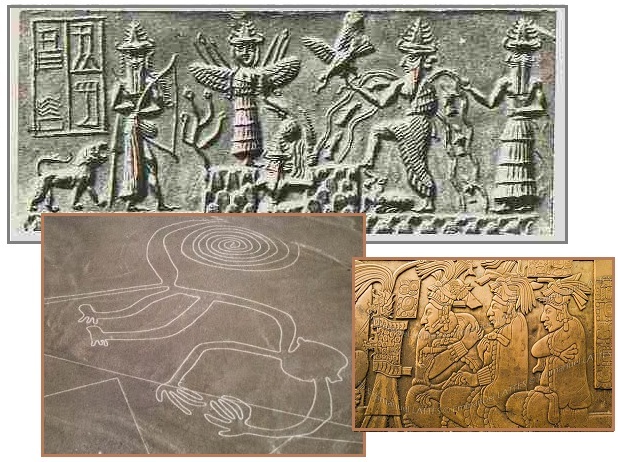 The ancient Summerians documented the appearance and lifestyle of the Annunaki, and since they also mined for Gold on Mars, many recent images from the Mars rovers and probes record their stay as recent issues of this newsletter document. This includes a goat’s skull, a live mouse, Gold dust traces left after a water wash, and an Annunaki doll. 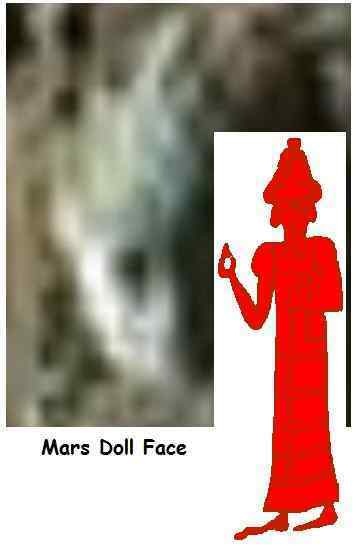 The forlorn nature of these artifacts shows that the Annunaki are no longer on Mars, though they are conducting robotically controlled mining for Gold in the solar system. Will mankind every encounter their prior slave masters? Since the Earth is destined to make the leap into 4th density approximately 100 years from now, and Nibiru is not ready for its Transformation as yet, this is unlikely to every occur. ZetaTalk Prediction 3/13/2010: The Annunaki reside on Planet X, and will for some time. Where they are considered peers of mankind, they have a decided negative bent, as they were influenced unduly by aliens in the Service-to-Self in the past. Thus, they are not participating in the Transformation as mankind is at this time, and will remain in 3rd density after the Earth switch to 4th density.